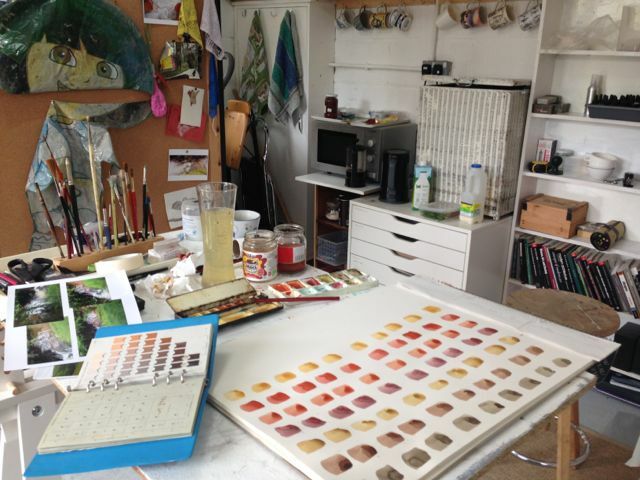 Today, in preparation for a Flux Chamber event at EAFS (29th August – Thornhill in Dumfrieshire), I’ve dug out my brushes and used brand new earth colour watercolour pans. Not something I feel expert in, or have tackled for a while, but there is a logic to this. The colour of riverwater is an indicator of how much carbon dioxide the river is shedding into the atmosphere. 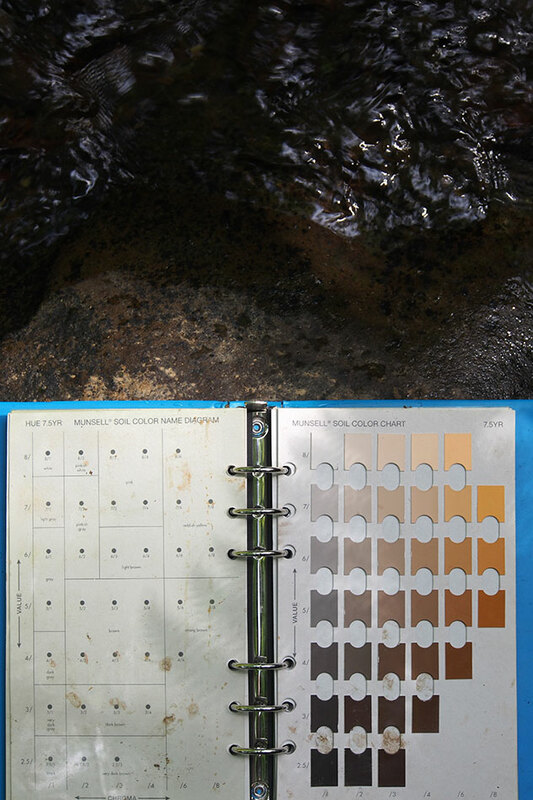 So looking at riverwater colour is one of the ways that you can see carbon landscapes. We’ll be talking about this on riverbank walks at the foot of the Lowther Hills. The idea is that walkers will get a leaflet which is a guide to seeing Carbon Riverscapes. Last month, I took a geographers’ Munsell’s guide to Soil Colours (courtesy of the University of Glasgow) to Wolf Glen. 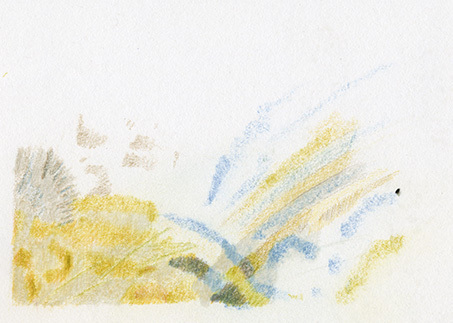 Crayons proved a slow way of rendering stilled movement of water. Another problem with this method of staring deeply into water is that the reflections on the water are not what is important to a biogeochemist – what matters most to her is the sediment that the water is carrying. The next step was to obtain watercolour pigment jars from Cornelissen’s Fine Art shop in London – and see how they looked. 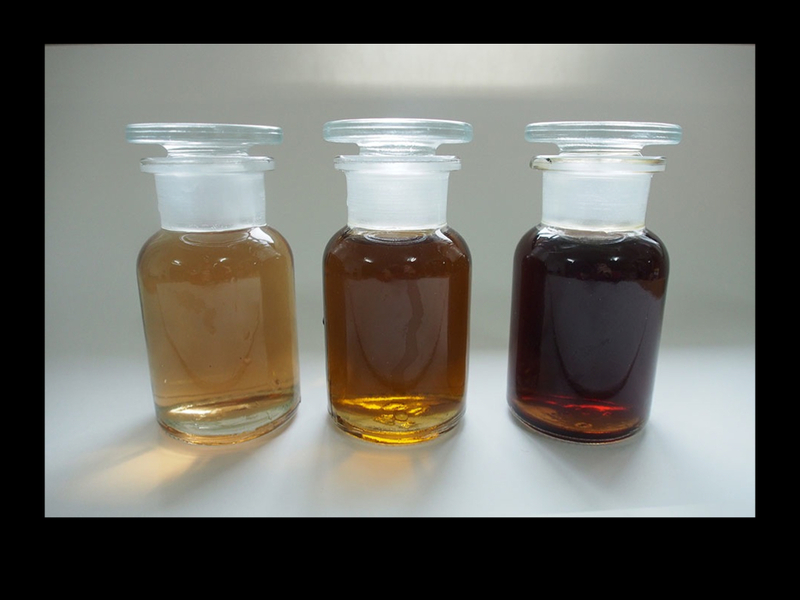 I’ll give these to the Flux Chamber biogeochemist (Susan Waldron) for her collection of samples of dissolved inorganic carbon (said to look quite like whisky). 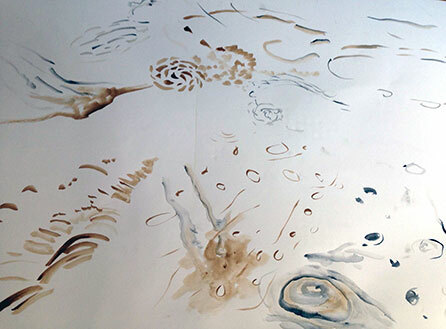 The ambition of doing daily watercolour readings fizzled out in the face of other jobs, but here are some initial impressions from video clips of the Ale water in fast flow. For the Guide to Carbon Riverscapes, the logic of the medium of water colour pigment was irrefutable – it is a suspension in water and comes in a range of earth colours (ochre, sienna, umber etc). And so I am dashing off a few paintings which hopefully will dry in time for Saturday week when we meet on the riverbank of Cample Burn. EAFS is taking place over the weekend of 29 and 30 August. 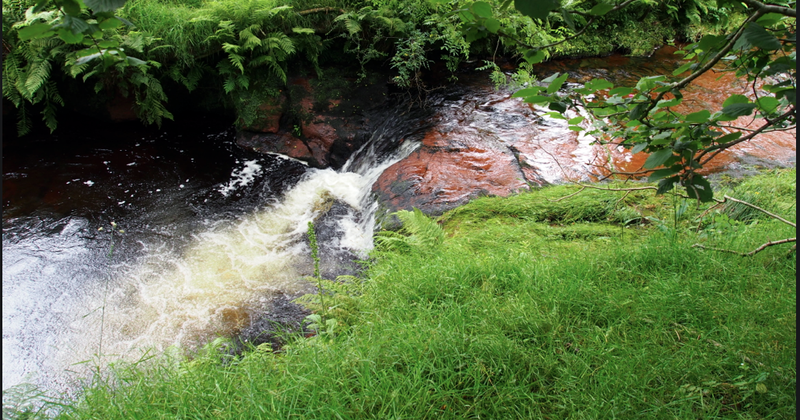 If you are able to join Flux Chamber on Saturday 29th (and are prepared for a walk on slippy muddy ground) there will be two riverbank walks along Cample Cleuch, starting out on a minibus from the EAFS basecamp at Morton Castle (book the morning walk online, or the afternoon walk at Morton Castle ‘Post Office’). We will explore Carbon Landscapes by walking along wooded sheep-paths in the company of a biogeochemist (Professor Susan Waldron), and an environmental writer (Dr David Borthwick). We will think about ways to sense and see carbon cycling, especially carbon’s movement from river-water to air, and see a demonstration of how carbon release is measured with a Flux Chamber. You are also invited to join in further exchanges (on paper and in conversation) over Saturday evening, information will available on site from the festival organisers – but do BOOK into the festival as a whole first). Next Next post: for the love of … Sphagnum!